The Washington Library serves as the repository for Washington’s original books and manuscripts. These pieces of printed history enables us to expand scholarship about Washington, while making findings available to broader audiences. We are continuing to build our library collection with the ultimate goal to re-create Washington’s library as well as to become the authoritative source on all things related to Washington. To accomplish this, Mount Vernon is seeking funds to acquire letters, books, and documents pertaining to Washington and his family that often become available at auction or through private sale. Amazingly, undocumented letters, manuscripts, and written pieces related to Washington come to light every year! Recently available Washington letters cover topics such as Washington’s early book-buying practices, his devotion to animal husbandry, Washington’s astute business methods, and his relationship with his step-grandson Washy and the importance of Washy’s education. The materials we are interested in purchasing offer deep insights into Washington and contain stories that deserve telling. To ensure Mount Vernon can effectively convey these stories and preserve these resources, we are asking for your help to pursue purchasing opportunities of Washington-related documents. We would be most grateful for your consideration of any gift amount to support these efforts. Some of these documents need conservation work when they get to Mount Vernon, including repairs and preservation. We will ensure these valuable documents are protected, conserved, and digitized. Digitization makes the documents accessible to a wider audience and enables researchers to study the digital letters while keeping the original safely protected. We would deeply appreciate your support, which will enhance our collection and scholarly resources for generations to come. Additional funding would dramatically expand our current ability to acquire and digitize Washington-related documents. 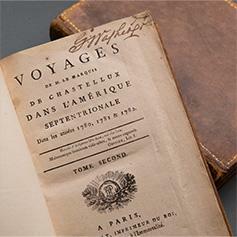 Documents such as these render invaluable stories and insights into Washington’s life, character, and influence. For example, Mount Vernon recently acquired a ledger providing more information on furniture that Washington purchased from the Fairfaxes, his close friends and neighbors, for use in the west parlor. Washington’s own notations about the appearance of these pieces were short and provided limited detail, making specific identification of items challenging or nearly impossible. However, the Fairfax ledger clears up much of the mystery regarding Washington’s purchases by providing additional details that allowed our staff to ensure the appropriate pieces are displayed in the Mansion.